Wow that escalated quickly. After blowing week one to the Los Angeles Rams, you follow that up by sharting the game against Denver by losing by a last second field goal. 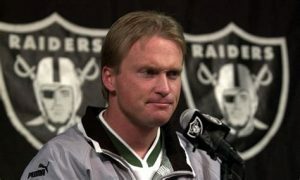 Jon Gruden who by the way will be making 10 million a year for the next 10 years, win, lose, draw or be fired; still coaches the team. Looks like he is going full Back to the Future driving the DeLorean in reverse. Glad the Raiders fell for this “charming sage’s” line of garbage and not my Bucs (they are 2-0 by the way) glad to see Gruden screwing up elsewhere. Derek Carr, the quarterback, which by the way I want my quarter back, actually all four of them this past week! This is a trash fire of epic proportions. Glad Gruden blamed both loses on a lack of a pass rush…you traded Khalil Mack for a couple first round picks and several Hooters gift cards you charming idiot! Actually rumor has it Gruden was 20 deep into a 50 piece of boneless wings at halftime man, the heck with halftime adjustments; it was honey BBQ Sunday man. Dang, I hate it when I run out-a napkins. In the aftermath of the loss, Raiders went full Raider Nation bringing back weed aficionado Martavis Bryant back on a one year contract a couple weeks after cutting him. Rumor has it he failed a drug test and is now appealing. Hey dude, don’t hold your breath for that to go away. How California. Bringing back a player who has a weed addiction, to a state that legalized it? Blog Father help me out here, is it illegal if he’s “cranking the hoon” and still playing in a state where it’s “legal”—allegedly, I will add. Kind of sad you guys didn’t trade for Josh Gordon of Cleveland on Monday, he would likely fit right in. During 4 years in the league he has failed more drug tests than games played. But then again, he would actually be a good match since most Raider fans have missed more days at work due to positive drug tests and hangovers than any other team, so he would fit right in. By the way, Khalil Mack has been a beast for DA BEARS who by the way are 1-1 compared you’re 0-2, sorry Raider fans it’s going to be a 3-13 year. 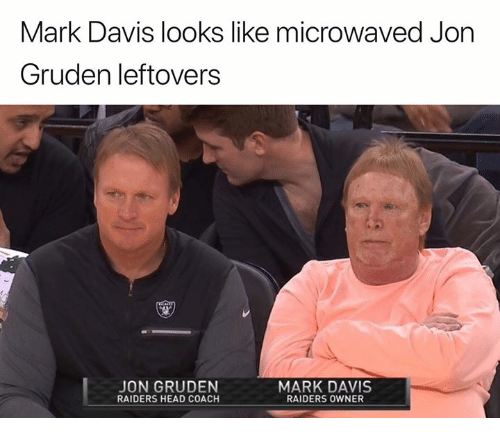 Get a good look at charming sage Jon Gruden again…….also Mark Davis still looks like Jon Gruden microwaved leftovers.